Amazing place! Better than the pictures! Pictures dont do it justice! This was a very nice cabin for a relaxing weekend away. Very comfortable couch and bed. A good collection of games and movies are in the cabin and all the dish-ware you could need for cooking. My wife and I came to one of the Wilderness View Cabins for our Honeymoon and we fell in love with it. It was so amazing to be able to spent such a time in our lives in such an awesome location! We cannot wait to go back to the same cabin! Wilderness View Cabins is a breathe of fresh air, literally! These cabins are secluded, beautiful and ideal for relaxing. I will most definitely book a stay here rather than returning to the the more crowded rentals in the smokies. Will be back!!! The amenities (outdoor jacuzzi, sauna, fireplace, pool table) are great and the staff was super responsive and very friendly. The views are as good as in the pictures. We had a great time and enjoyed the peacefulness and seclusion of the cabin. I highly recommend it. Great cabin, great location,... The weather was amazing and the linens were clean. Everything worked well and my family and I had a great time. The road to the cabin was a bit precarious but it didnt rain so it wasnt too bad. The people taking care of us were accessible and very responsive. I would recommend this cabin, it was a very nice experience. Very cute cabin in a fairly remote area. We saw a beautiful black bear on our first morning there. The hosts were very accommodating and responsive. I only wish we were there for a real vacation versus running from a hurricane. We stayed a week and had a wonderful time at the cabin. We cooked every night in the cabin, thanks for dropping off some small saucepans. Everything was as described and the pictures are accurate. We enjoyed the wonderful pool, the hot tub and the beds were comfortable. Communication with Wilderness View was excellent and the responses were in less than 30 minutes. Thanks for making our holiday successful. The perfect cabin for a mountain getaway! Its even better than the pictures and in the most beautiful area. We loved it. We had a great stay at the cliffhanger cabin. The house was lovely, as pictured, and we enjoyed the hot tub and fire pit very much. The beds were comfortable and the kitchen had everything we needed (2 sinks was a great bonus). The spot was very peaceful and secluded. We did have some trouble getting to and from the house in a Prius (we got stuck a few times) and the road could be especially tricky in a non-4WD if theres rain. Overall we had a wonderful time -- would highly recommend! But drive an SUV. 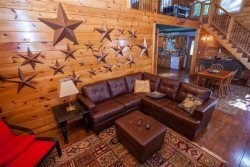 Gorgeous cabin, secluded but with awesome amenities and not far from town. We loved the porch during an afternoon storm and grilling out in the evening. Would definitely return with a larger party next time! Awesome cabin! We arrived after dark and the cabin was lit up beautifully! Perfect get away for the weekend for our family.